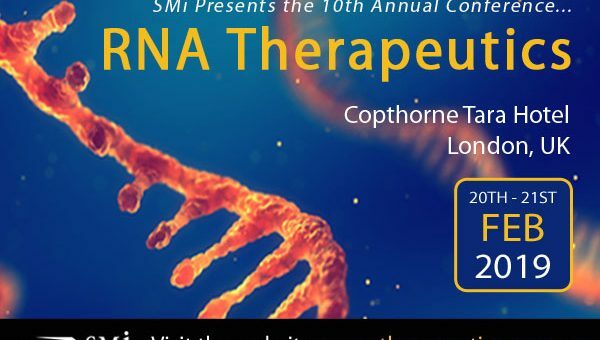 SMi Group announces the 10th Annual RNA Therapeutics Conference in London on February 20th – 21st 2019. Undoubtedly, the field of RNA therapeutics is currently undergoing a major expansion, and the potential for using RNA drugs for personalised medicines and immunotherapy, as well as to address genetic, infectious and chronic diseases will ensure the continued development of RNA therapeutics for years to come. Fulfilling the potential of genetic discoveries requires the development of therapeutics that can specifically modulate the expression of disease-relevant genes. RNA-based drugs, including siRNAs and antisense nucleotides, are promising examples of a newer class of biologics. Researchers have tried to overcome the major challenges for utilising RNAs in a therapeutic context, including: intracellular delivery, stability and immunogenicity. Join us in February 2019, for SMi’s 10thannual sell out conference, RNA Therapeutics. Bringing together industry experts from leading RNA companies, to discuss the challenges for clinical translation of RNA-based therapeutics, with an emphasis on recent advances in delivery technologies, and present an overview of the applications of RNA-based drugs for modulation of gene and protein expression, and genome editing. Marian Gindy, Executive Director, Pharmaceutical Sciences, Merck Research Labs, Merck & Co, inc.